We’re now well into January and the month has brought the cold weather with it. At this time of year, it’s more important than ever to look after your skin. I know that I step up my skincare regime during the colder months, ensuring that the beauty products I use contain natural and/or organic ingredients. 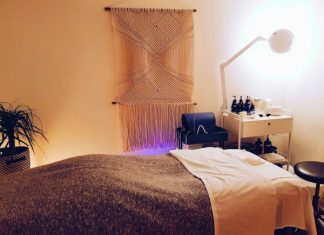 If you are interested in learning about new clean beauty products for January 2019, please have a read below. 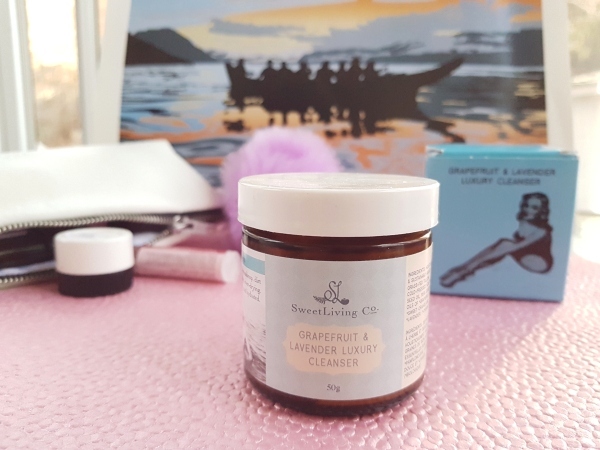 Grapefruit & Lavender Luxury Cleanser from Sweet Living Co. I was introduced to Sweet Living Co., a Saskatchewan beauty brand, at the MNDFL Beauty Pop Up in December. One of my favourite products is their Grapefruit & Lavender Luxury Cleanser. The secret beauty ingredient of many of Sweet Living Co.’s products is ethically-raised, grass-fed tallow, which provides a butter-like consistency to their luxury cleanser. Cleansing your face with cleansers that contain fat do not dry out your skin the way oil-free cleansers do. In addition, cleansers with fat are balancing in that they remove oil from oily skin and add oil to dry skin. Not only does this cleanser leave my skin feeling super soft, but the citrusy-floral scent of pink grapefruit, sweet orange and lavender essential oils signals to my body that it’s time to start the day. That’s why this is one of my favourite cleansers to use in the morning. Purchase Sweet Living Co.’s Grapefruit & Lavender Luxury Cleanser, $28 (50g), online. Helena Lane Rose Petal & Hyaluronic Serum is a light serum that smells of delicate roses. It’s so light that I can wear it under my moisturizer. 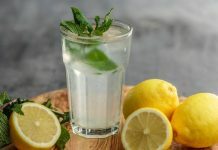 Hyaluronic Acid (HA) naturally occurs in the body with its purpose being to maintain water levels; as a result, it provides exceptional hydration. 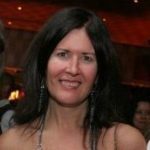 Helena Lane is a Canadian company based in B.C. 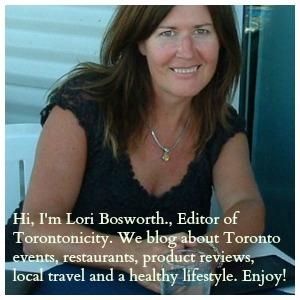 that emphasizes using only unrefined, unprocessed, natural and certified organic ingredients. The Rose Petal & Hyaluronic Serum contains 97% organic ingredients including Bulgarian rose hydrosol, which is known for calming the skin. I love that this serum is particularly beneficial for mature or dry skin – check ✔ check ✔. 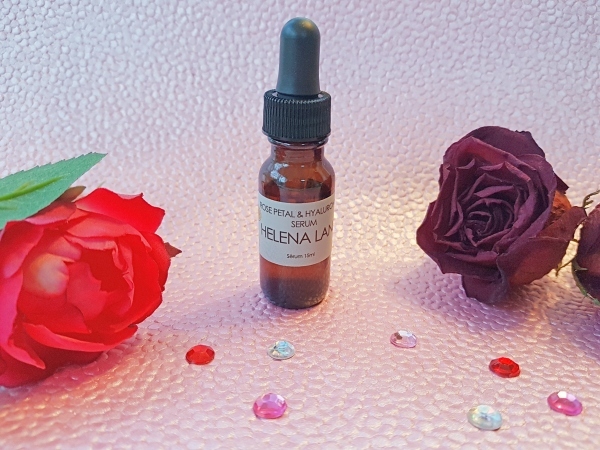 You can purchase Helena Lane Rose Petal & Hyaluronic Serum for $38 (15 ml) online. 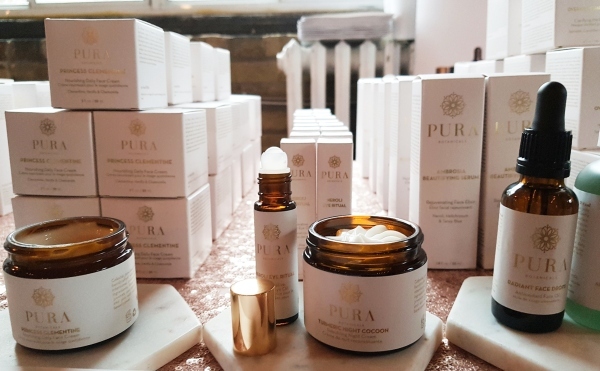 I’ve been wearing Pura Neroli Eye Ritual every night since I received a sample at the MNDFL Beauty Pop Up. First of all, I love that fact that this eye oil comes in a roll on stick, which makes it easier to apply under the eyes compared to a cream. It also smells exotic and calming. Neroli is an essential oil extracted from the flowering blossoms of the orange tree. It’s responsible for getting rid of unflattering dark circles under the eyes, as well as increasing collagen production. The eye ritual also contains Aloe Vera, to get rid of that unattractive puffy eye look while Jojoba oil provides hydrates dry skin. I look forward to inhaling the exotic scent before my head hits the pillow. Purchase Pura Neroli Eye Ritual for $48 (9 ml) online. 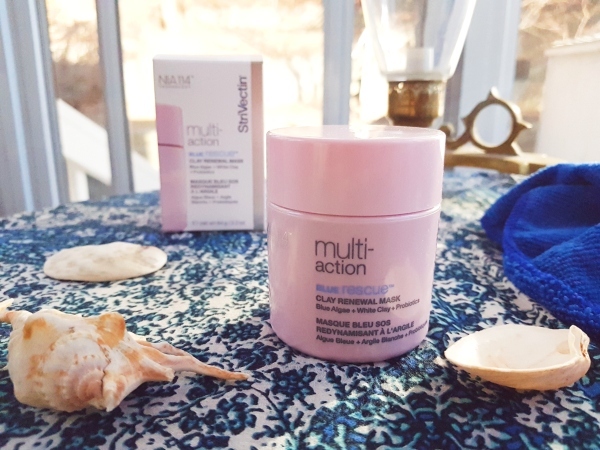 StriVectin Multi-Action Blue Rescue Clay Renewal Mask is a gorgeous mask to apply. 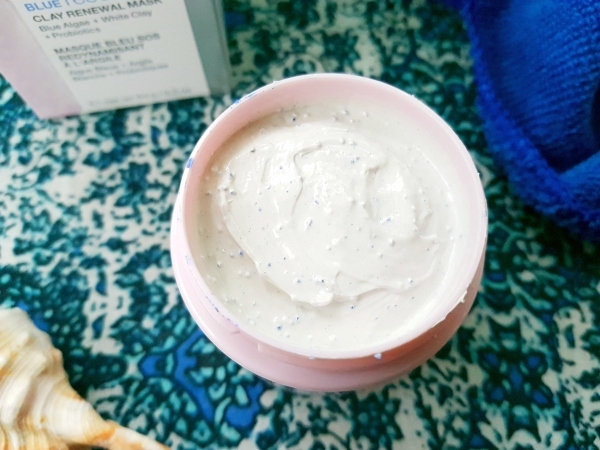 The mask contains blue algae, red seaweed, probiotic ferment, white clay and shea butter. Although it contains clay, the mask’s texture is quite creamy. Apply in an even layer and then gently massage into skin and watch as the mask, which is a light green shade, turns blue. After leaving on my face for 10 minutes, I went to wash it off with a cloth and was surprised at how easily it came off my face unlike other masks where you have to really scrub to remove them. 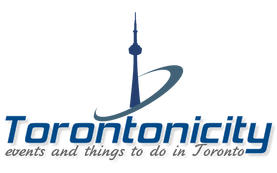 I noticed that my pores appeared smaller and the redness in my skin was reduced. Unlike other masks, this mask left my skin feeling moisturized. Purchase StriVectin Blue Rescue Clay Renewal Mask, $49 (3.2 oz.) at Murale by Shoppers Drug Mart. We all know that drinking tea benefits us due to tea’s high anti-oxidant content. So why not use a skincare product that includes tea? Teaology has done just that. Teaology products contain no water, just 100% tea infusion to give you the full benefits of tea. If you need a refresher on what those are, tea contains up to 30% of polyphenols, which keep your skin looking youthful, caffeine for toning the skin and minerals for skin rejuvenation. 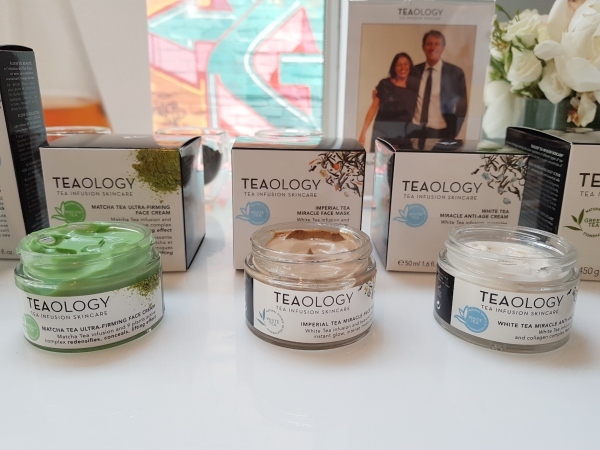 Matcha Tea is particularly high in catechins (EGCG) that fight free radicals so it’s not suprising that Teaology has introduced Matcha Tea Ultra-Firming Face Cream. This face cream has a natural green tint from Match Tea that will absorb into your skin. 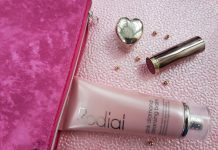 The super smooth consistency of the face cream ensures your face remains hydrated all day. I particularly love the face cream’s sweet smell of Matcha Tea. Purchase Teaology Matcha Tea Ultra-Firming Face Cream, $69 (50 ml) at Murale by Shoppers Drug Mart. Please let me know in the comment section if you get a chance to try these clean beauty products for January 2019. These look like great beauty products. I am in kind of a beauty rut lately and it is nice to try some new products. Thanks for sharing these – I hadn’t heard of any of them and I’ll have to check them out. I love strivectin products! Going to check these other ones out too! This is the first time I have heard of Strivectin products. 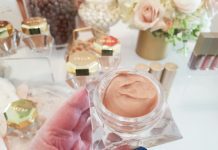 I am always interested in learning about new skin care lines. Interesting to see how tea is used for things other than just to drink. Always great to see natural ingredients in products versus chemicals. These beauty products all sound great. I’ve seen Teaology at the store and thought about buying but decided against it. Now I’m definitely buying and trying it out. I would like to try any of these products.